Take a look at this gorgeous, modern kitchen we created for this customer in Danville. We fully embraced the modern look of white cabinetry, which in our case is completely custom-made. We also went with brand new counters, sink, flooring, the works. 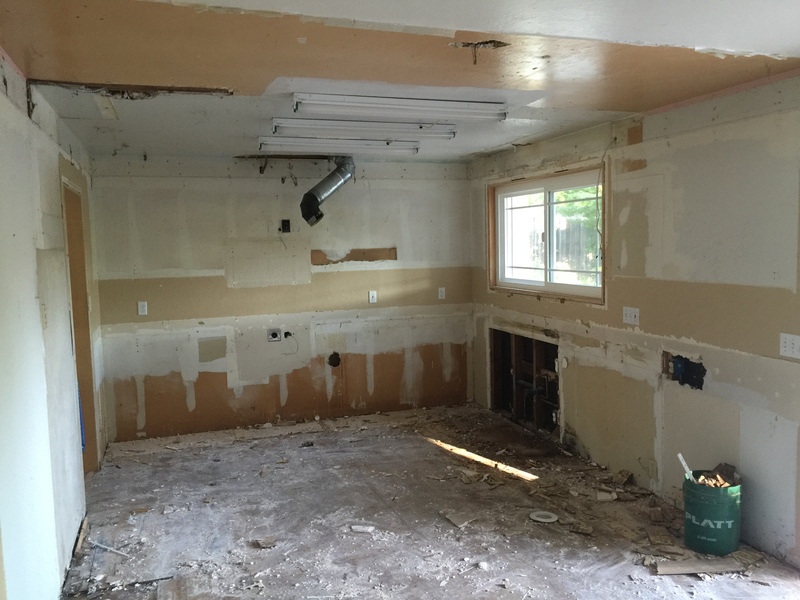 This kitchen remodel in Danville involved stripping out the old kitchen and replacing everything. 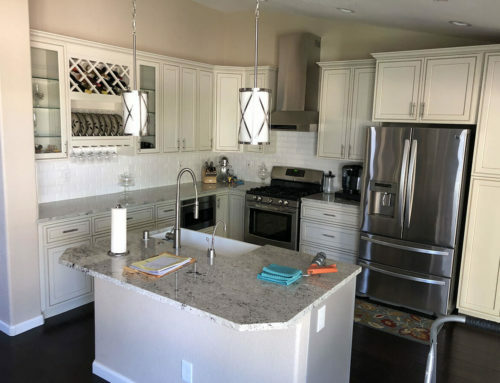 After completely gutting the kitchen, we came back with custom built cabinets, new flooring, contemporary counters and backsplash, and a brand new exhaust hood. 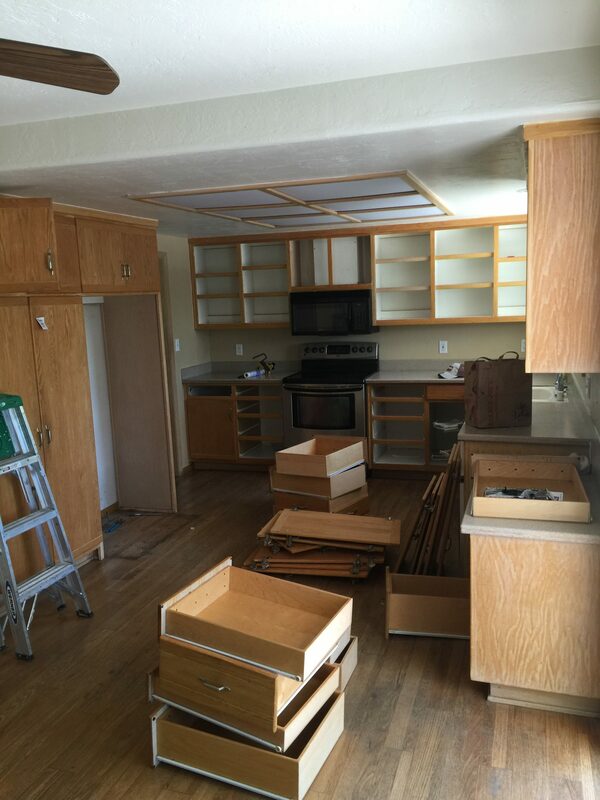 Here are the pictures we took before, during, and after the job was completed. 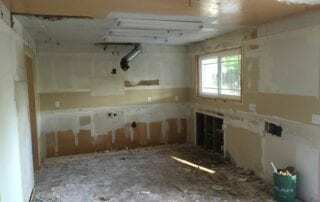 As you can see, the room went through a major renovation. 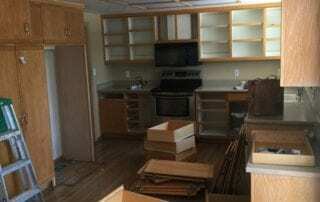 We completely removed all of the old cabinetry and flooring and replaced it all within the span of just a few days. 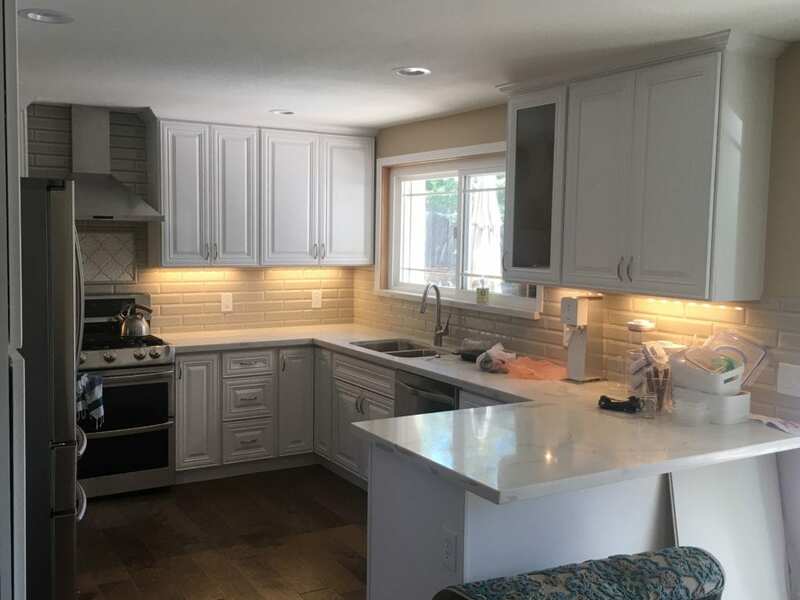 Some of these renovations include the addition of a kitchen exhaust hood, a subway tile backsplash, and newly installed, white quartz counters. The kitchen’s new, white aesthetic completes the look, perfectly tying the room together. 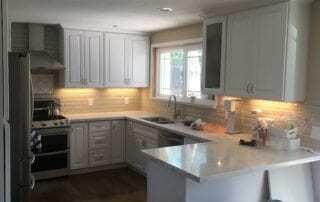 This kitchen remodel in Danville needed a modern overhaul. We installed a beautiful exhaust hood, white raised panel cabinet doors. and a patterned white quartz countertop. With these additions, we added quite a bit of character to the room. 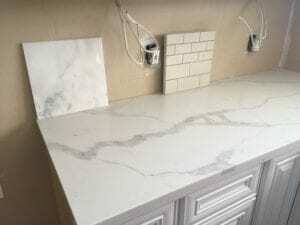 This photo was taken when we were almost done with the renovation before the backsplash was installed. 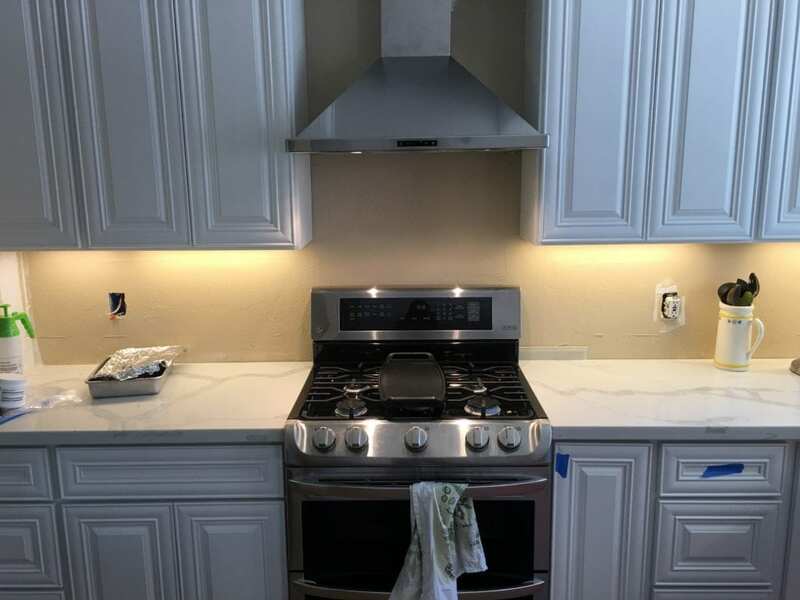 The next photo shows what a difference backsplash can make! 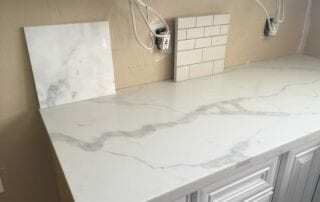 Check out this backsplash! The subway tile throughout the kitchen added a much-needed design element. 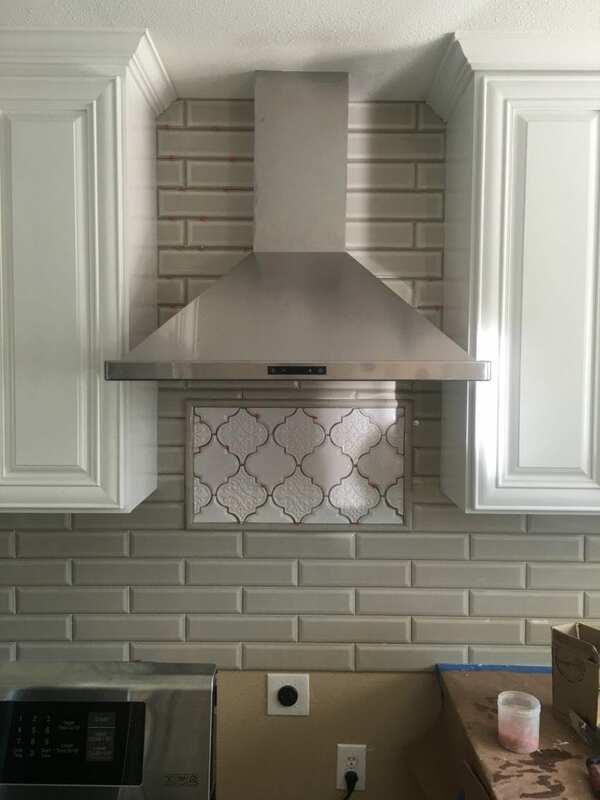 We wanted to add some extra flair to the simple backsplash, so we created a lantern-shaped panel of tile. This was installed in the center of the area behind and beneath the hood. We love to add special touches like this in many of our projects, which our clients love! As you can see in the “before” photo above, the original counter ended just to the right of the sink. When we were designing this kitchen, we all agreed that extra counter space was necessary. So we extended the counter into an L-shape. This not only gave them more counter space but provided additional storage underneath. This has made a huge difference for this family! We also love the choice of white quartz countertops, providing a clean, modern look to this Danville kitchen remodel. Like every kitchen we renovate, we used our proven attention to detail at every step. We incorporated neutral blacks, whites, and grays without giving the room a dull, monotone look. By using patterns in the backsplash and countertops, we made it much more aesthetically pleasing while retaining the neutral, modern look. When patterns are used this way, they attract attention that may otherwise be lost in the lack of colors. In the end, this Danville family was thrilled with their new kitchen! 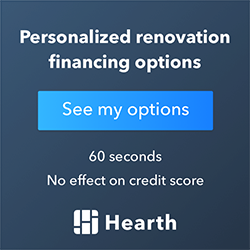 Are you ready to remodel your kitchen? Contact us for a free estimate.